I know I’m not alone in saying this and that any other photographer will tell you the same thing, the less time you can spend editing images the better. Of course, taking a perfect image to start with is the fastest way to reduce your workflow (and frustratingly, the hardest! ), but the reality is there will always be some form of workflow in the digital age. And with that in mind, I try to adapt mine in any way I can to speed up processing time. Be it keyboard short cuts, actions or touch gesture interaction. But the single biggest way I’ve improved my workflow is by ditching my traditional mouse and switching to a tablet. I’ve not done an equipment review post for a while now (there are several in the pipeline) so thought I’d get back in to it by talking a little about the Wacom Intuos5. There are a ton of good reviews of this tablet already out there, so I’m not going to cover old ground. Plus, I imagine the average photographer won’t care so much for the technical details and more so about how it’s going to help speed things up. So think of this more as an over view combined with some thoughts on how tablets can potentially improve the workflow from a photographers point of view. Weighing in at almost £300 for the Medium, the Intuos 5 Touch comes in Small, Medium and Large sizes (roughly A5, A4 and A3 surface area). For most screen sizes and photographers, I’d recommend the Medium as you end up having to move your arm around too much with the larger size plus the footprint on the Medium is a good balance of desk space vs usable tablet area. The Touch also has two banks of programmable Express Keys separated by a touch ring. However the OLED labels from the older model are now gone, and the whole Express Key control area and outer surround is now covered in a rubberised material. It also comes supplied with the same pen and 10 user replaceable nibs which offer varying levels of pressure and emulate the feel of different pen types (the pen is battery free as well, and the whole tablet is powered by the USB connection). The Intuos 4 and 5 offer 2048 levels of pen pressure. That’s great, but what does it mean? Simply put, the more levels of pressure there are the more variation you can have in the weight of your brush strokes when painting over masked areas, dodging and burning etc. The active area of the tablet is now also highlighted by corner lights and added to this, the active area now ends before the surface area meets the surrounding of the tablet itself. This is good news as with the older Intuos4 I would often have the pen hit the ridge between the active area and edge of the tablet and get ‘stuck’ requiring me to lift it out. Annoying if I was doing some form of drag and drop near the bottom of the screen. A small thing, but annoying and I’m glad it’s been resolved now. 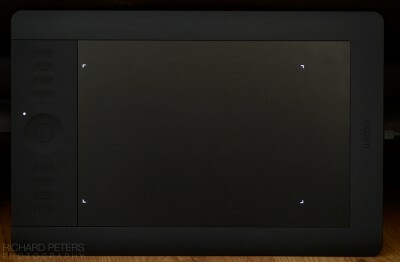 With the loss of the OLED screens on the tablet, the buttons on the Intuos5 are touch sensitive so that placing your finger lightly on any of them will bring up a HUD on the monitor reminding you what each button does, and these labels are custom editable so you can name them what you want for the most part. To further aid with Express Key use they also have some slight tactile differences, with the two centre Express Keys in each bank having ridges on them to help identify them without having to look away from the screen. And don’t worry if you’re left or right handed, the Touch is designed to work either way round making it operate just the same whether you are left or right handed. For those who like ultra clutter free desktops, there is also a wireless module available, although good old fashioned USB still works for me (and of course, is cheaper). I really liked the OLED labels of the older model but I will admit the overall feel of the Express Keys on the newer model is a little nicer. After an extended use of a couple of months I’m still on the fence of what I prefer, OLED labels or a HUD. I guess that one comes down to personal preference. BUT HOW CAN IT (OR ANY OTHER TABLET) HELP WITH WORKFLOW? Ok, so that’s a brief look at the Intuos5 Touch. But why buy one? In fact, why buy a tablet full stop? For me the reasons are simple. A tablet offers a far greater control over the cursor on screen, once you are used to them. Have you ever tried to write your name on the computer using a mouse? It’s not easy and unless you take your time it ends up looking like you’ve written it with your other hand. It’s far more natural to write, draw and point, with a pen and your fingers. And that’s where the tablet can reign supreme. Selecting items from menu’s, drawing shapes, painting in masks, using the clone or spot tool to remove dust spots, it all feels more natural, accurate and faster with a pen. But again, it can be tricky getting used to them at first and there is certainly a learning curve before you can get the best out of them, especially getting to grips with understanding the way the tablet surface area represents your screen. For example, place the pen nib on the bottom left of the tablet and the cursor appears bottom left of the screen. Lift the pen nib and place it top right of the tablet and your cursor instantly vanishes and reappears top right of the screen. You get the idea… it’s not like using a mouse where you can lift and move the mouse, when you run out of scrolling space on the desk, and the cursor stays put until you put the mouse back down and continue moving it. Sounds very simple and obvious I know, but when I first switched to a tablet I almost felt like I was chasing the cursor around the screen and it was very frustrating initially! Fight past that though and the rewards are huge offering you very fast, very accurate control of your cursor. The Intous5 of course then takes that a step further with it’s various Express Keys and touch sensitivity for finger gestures (I still think that sounds rude every time I type it! ), all of which are highly customisable and programmable via the Wacom software. A typical use for all this customisation would be to have the Express Keys launch your favourite apps and software when you’re on the computer desktop, then once in that software the functions change and suddenly your most used editing tools or most used actions are just a button press or gesture away. Imagine, you’re painting a mask around an image to selectively sharpen something and you make a mistake, rather than navigate to the Edit Menu in Photoshop, or use the three finger keyboard shortcut, you can simply press one Express Key or do a two finger swipe to undo it. That may not seem much faster, but it really is because over extended periods in front of the computer, the less distance you have to move your hands the faster you can perform tasks, and the odd second here and there saved on frequently performed actions and commands adds up! Another great feature of the Intuos5 is the Precision mode. At the press of an Express Key, this highlights a small area on screen around wherever you currently have the cursor placed. With this mode switched on, instead of the entire surface of the tablet reflecting the entire screen of your computer, the entire tablet surface now only reflects the small Precision Mode area highlighted on the screen. As the name suggests, this gives you incredible precision when working on areas of the image with fine detail as you have to make far broader movement of the pen on the tablet to move the cursor within the highlighted PM box, giving the effect of making the cursor much sower and easy to control. Getting used to them. That’s the only real negative for me. They simple aren’t for everyone and initially can feel like an exercise in dexterity control rather than a way of navigating around a computer. But as I’ve said, the rewards for adapting are huge and I literally put my mouse in a drawer and left it there once I switched. I find everything can be done faster and more intuitively holding a pen to a tablet. Not just photo editing, but general computer tasks too. If I’m being picky though with regards to the Intuos5, it doesn’t feel quite as slick or fluid when performing hand gestures as with a native trackpad on OSX, but that’s not to say it doesn’t work well, as it does and I found myself constantly flicking between pen and finger gestures as I went about my processing and computer navigation. My other small gripe with the touch sensitivity? The software is designed to switch off the hand gesturing when it detects the pen being used, and this works very well. However, I did find once in a while that with my hand resting on the active area of the tablet, at times the software would pick up the palm of my hand moving on the tablet if I raised the pen briefly and it would inadvertently active the gesture to zoom in to web browsers pages. Not a huge problem, and it only happened when surfing the net and even then only once in a while, but it happened enough for me to take note. SHOULD YOU GET AN INTUOS 5 TOUCH? The Intuos range are not the cheapest ranging from £180-380 depending on the model of choice, and of course not everyone gets on with tablets or can be a little wary of them. If you have used mice for years, then swapping to a tablet can feel cumbersome and awkward at first. It did for me. And so jumping straight in with something this expensive and, to the uninitiated, seemingly complicated to get the most from, might not be a good prospect. In that situation I’d suggest checking out one of the cheaper entry level tablets such as the Bamboo, which start at around £50, to see how you get on. However, if you’re already a convert and looking to upgrade, or you are new to the tablet world and like jumping in at the deep end, then the Intuos5 is superb and I’ve not doubt it will speed up the way you work. For me, being a long time tablet user already, adding in the the ability to do hand gestures to navigate my way around on top of the already great feature set has been the icing on the cake. Like I said when I kicked this blog post off, as photographers we all want to spend less time editing and more time shooting. Aside from a faster computer, improving your workflow is the best way to do that and customisable tablets can be a very powerful tool to assist you in making the most of your time sat at the computer. For more information on the Intuos range of Wacom tablets, check out the Wacom website.